This edition covers many small but important improvements that will help you optimise your workflow even more. 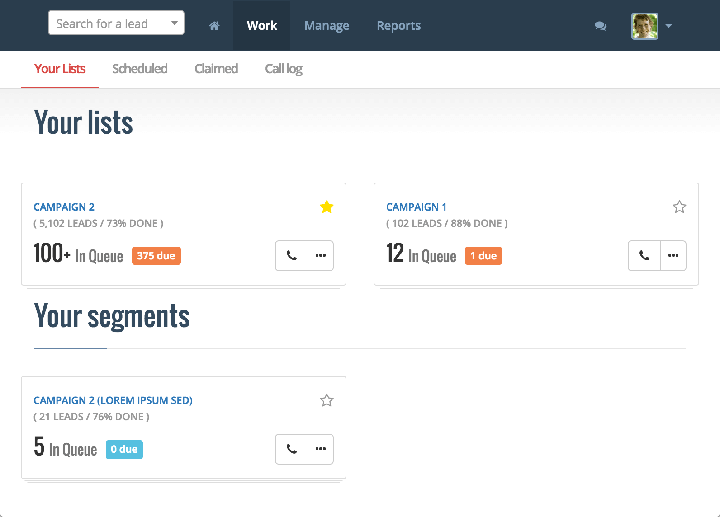 I'll tell you about some new features, such as improved control on auto claim, favourite lists, lead delegation and more. Do you have too many lists and segments? Struggling to find the right list when you sign in? Now you can mark the lists and segments on which you work the most as favourites. Favourites show up first in the list overview on Work -> Lists. You can have as many favourites as you like, but we recommend having no more than six at a time. That will place all your favourites on the work dashboard and prevent the need to hit ‘view more’ to find the list you are looking for. You can favourite a list or segment by toggling the little star on or off. The sort will take effect the next time you load the overview page. It’s finally here: the ability to delegate a lead to another agent. Delegating means that the agent to whom you delegate a lead gets the claim for that lead, and the lead will then only show in that agent’s queue. This is useful in several situations. For example, if a supervisor wants to register a sale on behalf of another agent, she can delegate the lead first and then hit ‘winner’. This feature is currently only available to supervisors. We are evaluating the best way to enable it for all users. As always, your feedback is more than welcome! Auto-claiming is a nice feature that is enabled by default. It helps make sure that leads are claimed if they are marked for follow-up at an exact time. This is based on the assumption that a lead scheduled for a specific time must be someone with whom an agent spoke and who the agent agreed to call back at an exact time, so the same agent should call the lead back. 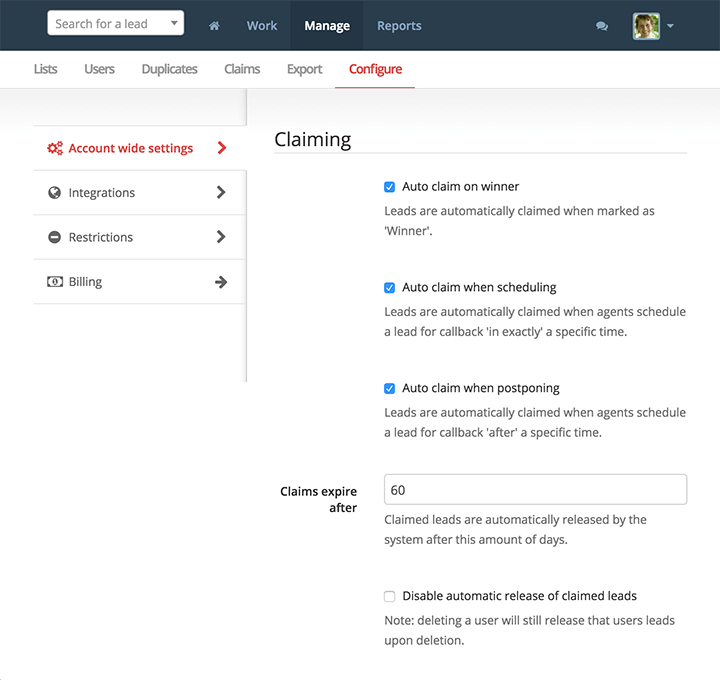 Auto-claim also triggers when you win a lead, for the same reasons. Now, admins have greater control over this behaviour. Even though the default makes sense in most cases, you might need to tweak this to better fit your situation. That’s why admins can now enable or disable parts of this behaviour while keeping the settings that work for them. Many of our call centre customers has asked for the ability to share reports for certain lists with their clients. This is now possible because we changed how the rights management works. Now, users can only view reports for the lists to which they have access. In addition, we introduced the agent role, which is enabled by default. This role provides access to view and call individual leads. The idea is that by removing the agent role, enabling the analyst role and providing access to certain lists only, you can create a user in myphoner for your client, thus giving them access to follow your progress as it happens directly from within your myphoner reports. For everyone else, this means your analysts should have access to all the lists they need to know about. Archiving lists: Lists can now be archived instead of deleted, which will remove them from the work dashboard and remove their leads from search, duplicates and queues. However, the data will be retained for reports. Archived lists can be restored at a later time. This is the recommended way to remove a list from your account. Custom VOIP handle: Link to initiate click2dial via an external VOIP vendor or similar. Useful if you have a custom URL that can activate a call between your phone and the lead, e.g. voip.provider.net/path/to/account?agentId=1&numberToCall=0012345678. IP restrictions: Admins can now set a range of IP addresses from which users must login to use the system. This range is managed at Manage -> Configure.